Do you remember the story I told you about Chester the cheetah? I want to tell you more about him, but first, if you have not read about him you need to now. Go to Pride. In our first story, we learned about boastful Chester. Chester thought he was better than all the other cheetahs. He learned his lesson after a race with Norman, another cheetah. He discovered how lonely he was and how arrogant he had become. Chester wanted to change, and that very day he decided to. Chester still had to fight the temptation to be proud, but he had learned his lesson. Each time pride started to boil up inside him, he would shove it down. He would also say he was sorry as soon as he said something cruel. Some time had passed since that momentous day of the race and the transformation of Chester. Transformation means change. When you see Chester now, you see a cheetah surrounded by friends. He is humble, kind, helpful, giving, and loving. Chester started a class to teach young cheetahs how to run faster than they normally do. As you remember, Chester was always the fastest runner in the coalition, and when his attitude changed he wanted to share his secret of success with other cheetahs. He is patient and kind to the cheetahs. The young cheetahs look up to him and are learning fast. 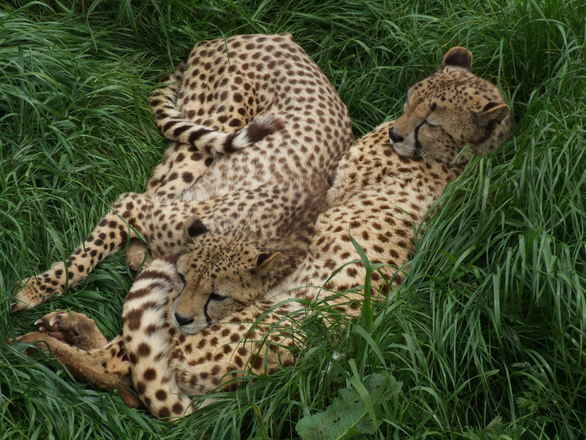 Every day there are races between cheetahs. They are all done out of fun and for practicing their skills. Chester has a star pupil. His name is Ethan, and he is Chester’s little brother. Ethan wants to be fast, just like his brother. Every day before Chester teaches the other cheetahs, Ethan asks Chester to take him to practice. Chester agrees and takes Ethan to the track they made. It is really just a worn path that they use to train on. Chester observes Ethan and gives him pointers and sometimes they race. Ethan is getting faster and faster. Chester also observes Ethan’s attitude. Ethan is not like how Chester used to be. Ethan is like how Chester is now. Ethan is kind to the other cheetahs. Ethan does not think of himself more than he should. He doesn’t tease others who are slower. He encourages them. He pats them on the back and says things like, “Good job!” or “That was your best time yet.” He also watches after the younger cheetahs and plays with them. One time, Chester saw Ethan slow down so one of the other cheetahs could win the race. Chester asked Ethan why he did that. Ethan shrugged his shoulders and said, “Phil doesn’t think he is very fast and I wanted to encourage him. I knew if he beat me he would keep trying harder.” Chester was proud of Ethan. Ethan wanted to be fast but not so he could be boastful or proud. He just wanted to be good at what he liked to do. Ethan liked to run. Isn’t that the way we should be? We should like what we are good at and practice it, taking pride or fulfillment in our efforts. However, we should not be proud that we are better or the best. It is good to work hard at learning a sport or musical instrument we like to play. We should take pride in doing our best in school. I didn’t say getting all A’s, I said doing our best. We should have self-respect for the effort it took to get a good grade on a test. However, we should not tease or boast about it to others, especially those who are struggling with that subject. There is a difference in attitude. The Bible says in 1 Peter 5:5b and James 4:6b, God resists the proud, but gives grace to the humble. Humble means: modest, meek, unpretending, or not putting yourself more important than someone else. Proverbs 16:5a, Everyone proud in heart is an abomination to the Lord. Abomination means to hate or despise. Proverbs 16:18 says, Pride goes before destruction, and a haughty spirit before a fall. Matthew 18:4 Therefore whoever humbles himself as this little child is the greatest in the kingdom of heaven. Proverbs 11:2 When pride comes, then comes shame; But with the humble is wisdom. Memorize: Proverbs 11:2 When pride comes, then comes shame; But with the humble is wisdom.